Adventure Time fans would be delighted with this humungous 352-page hardcover. It's really worth the money considering the price and how much content there is. 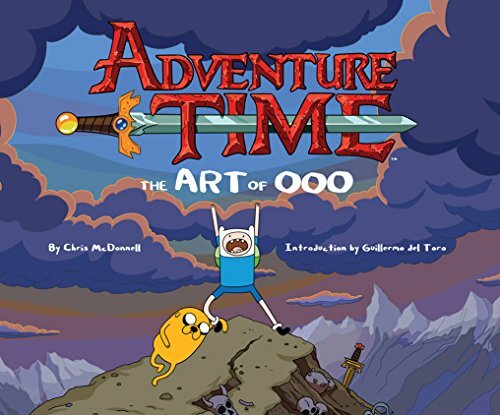 Adventure Time: The Art of Ooo provides an in-depth look at the origin of the animation and the creative process of making one. It's packed with concept art of the characters, environments and the early sketches used by creator Pendleton Ward's for pitching to studios. The characters are amusing and the art style is certainly very "Adventure Time". The highlight of the book is the lengthy interview-style text from the start to the end of the book. The staff artists talk about the stories, characters and art. It's written in a casual manner but yet is very insightful. You'll read about the history of Adventure Time, the story pitches and changes that led to Cartoon Network picking it up, style guides on how to draw the characters, interviews with voice actors, and a lot of interesting things that happen behind the scenes, the many side stories, muses. For the artworks, there are lots of character designs. Finn the human, Jake the dog, Fionna and Cake, Ice King, Bumblegum Princess, Rainicorn, Earl of Lemongrab and many others. Environment art are of the various kingdoms, space, the Tree House, "Beautopia" and other settings in the post-apocalyptic, magical land of Ooo. The character designs are unusual. The artists explain the style guides, like why Finn only has dots for eyes, the rules for the world of Ooo, e.g. if you're born with dots as eyes, you're not supposed to grow sclera, the white part of the eye. The Cosmic Owl's design was inspired by a light pattern that hits the urinals in the toilet at the workplace. Many of the designs look like they could be doodles from some kid's textbook. But that's also part of the charm because not everyone can draw like that. Pendleton Ward had great difficulty assembling a crew of artists who can draw just like that. All images are captioned to explain what they are and where they come from. The last section of the book is dedicated to fan art. This section also has the staff artists drawing the characters in any style they like, e.g. such as in Street Fighter style. Adventure Time: The Art of Ooo is a wonderful book that looks at the work it takes to make such as animation possible. It's well written, insightful and fun to read. Highly recommended to fans of Adventure Time. There are two publishers for this book, Titan Books and Abrams. Abrams seems to be distributing for USA and Canada, and Abrams for Europe.